1. 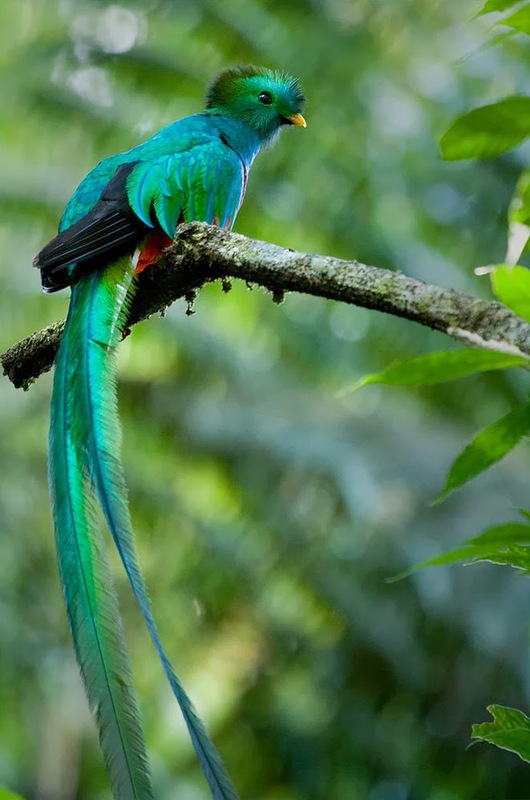 Quetzals are members of the family Trogonidae. 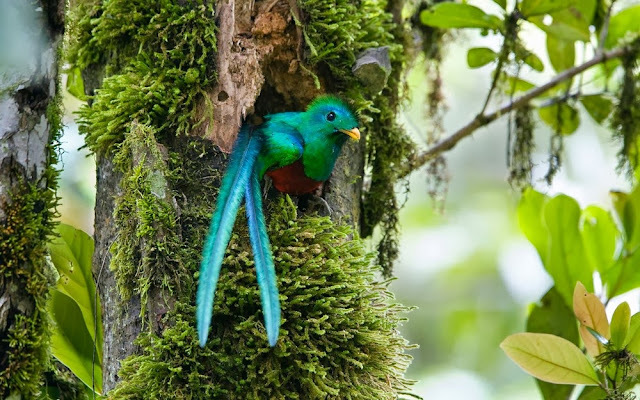 The golden-headed quetzal has a large range; they are found throughout Panama, northwest Venezuela, the Andes of Columbia and south to northern Bolivia & Peru. 2. The golden-headed quetzal is well adapted to lush tropical and sub-tropical areas. 3. These birds prefer to eat fruits, with avocado being a favorite meal. They will also eat lizards and insects especially during their breeding season. When seeking fruit, they make an upward sweeping flight. Some fruits rely on this family of birds to spread their seed. 4. 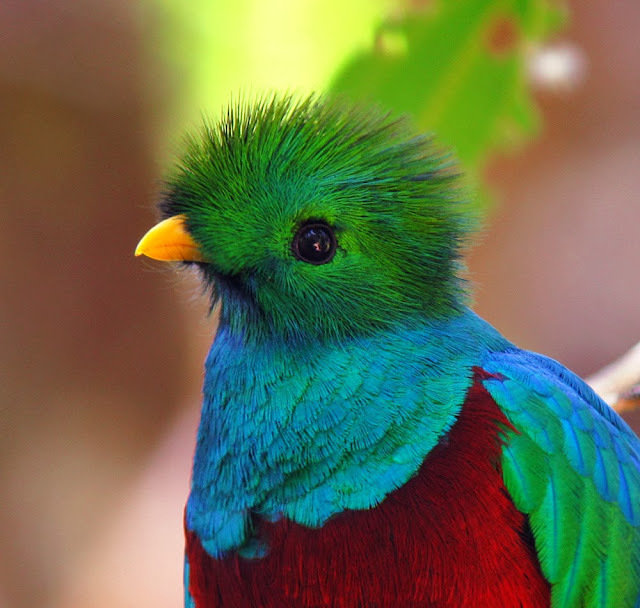 The golden-headed quetzal is about 14 inches (35 cm) long. Both sexes are colored a bright iridescent green with a red underbelly and golden-colored heads. Males tend to be more brightly colored than the females, with a solid black tail and a yellow-orange bill. Females have brownish bills, shorter green tails, and a dull brownish-golden head. The gold feathers are also iridescent and appear brighter or golden in sunlight. 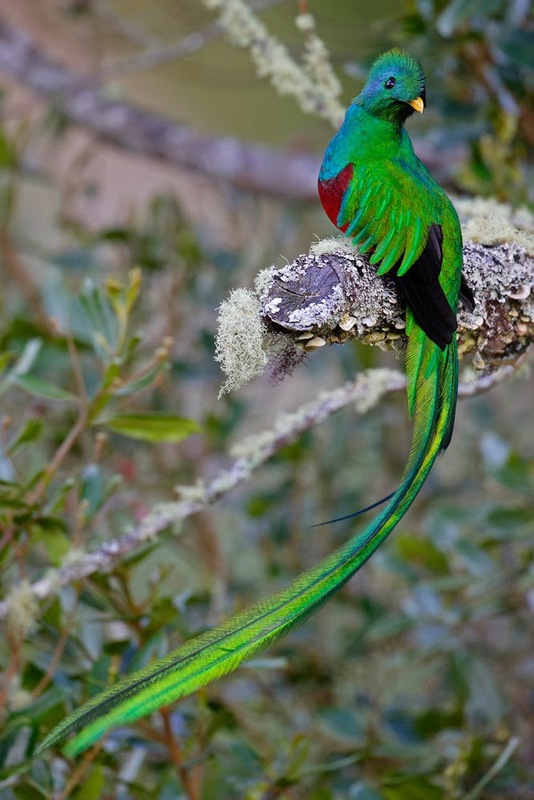 Quetzals have short, rounded wings, broad squared tails and small legs and feet. They are zygodactyls, like parrots, which means they have two toes facing forward and two facing backwards, helping them to grasp perches. 5. Quetzals are largely sedentary birds, relying on their brilliant green feathers to camouflage their location in the rain forests as they perch quietly for most of the day. 6. These birds make a variety of whistling, clucking calls to maintain pair bonds and communicate with their mates in the thick forest vegetation. Their wide bills can accommodate large pitted fruits. They swallow the fruits and then disgorge the pit. This allows trees to have their fruit dispersed for future germination. 7. Revered by the Mayans, the quetzal feathers were worn only by priests and nobility. 9. Guatemala proudly uses images of the quetzal on its flag, the national shield, postage stamps, and has a currency called the quetzal.